Top tier Fairy Tail scaling? Basically there are two different calculations of the energy output of Etherion, and we need help to decide which method that is more appropriate to use, or if somebody needs to combine the different methods into a single version. Take note that only calc group members, CinCameron20, DodoNova2, and interested staff members with something worthwhile to say should preferably contribute to this thread. When we evaluate calculations we do not necessary are required to always go with the absolute low end. Instead the goal is to go with the most logical result after having evaluated not only that one specific feat but also have taken the surroundings in the verse into consideration. It is confirmed that Etherion was actively used in a time prior to the story. And is confirmed to be able to wipe out an entire country on the continent of earthland multiple times.Please also note what emphasis is given on "one-shot / immediately etc.". And the discussion whether or not it should be used on Ka-Elum, a country of bigger size than Fiore. It never happened on panel. As such i can understand, and are of the same opinion, that we can not just randomly assign a calculated value for Etherion using the values from countries such as Iceberg, Desertio, Minstrel or the Pergrian Kingdom. A logical and fitting assumption however would be to use the values for the smalles possible countries. The smallest possible country would be either Midi in the southern Edge of the world map or Ila. Given canon sizes for Fiore it would allows us to scale the size of Fiore and then Midi/Ila - using the found size for Etherions destructive capabilities, taking all the canon evidence into consideration. I am 100% with DodoNova and Raven here. Our goal is to find the average value, not the lowest end of the lowest end. I also agree with Raven. Okay. What about the method used for calculating the energy output required to destroy the average-sized country then? Is DodoNova2's or are either of CinCameron20's more appropriate to use? With reservations for that I may have stated a stupid question, as I am juggling a lot of different tasks at once, so it is hard to remember the specifics. Since Raven does propose that we use one of the smaller countries (Ilia or Midi), I agree. Going from statements in the Manga, we're probably going to resort to Near-Total fatalities (the HE), so Country+ for both. @Ant - it seems as thought Raven is not accepting either due to questions posed in my blog, and that Dodo's blog includes the largest countries in the calculation, so Raven is proposing we use one of the smaller countries since the manga repeatedly states that "a country would be wiped out by Etherion"
I agree with using one of the small countries in the map. I have asked all of the current calc group members to comment here, so we just have to wait to see what they think. Would combining your method with DodoNova2's average size or the area of Fiore be more appropriate? According to Cin, Ilia is 956km in radii. I also agree with Raven. We should always go with the end that makes the most sense, in both in-universe logic and mathematical accuracy. Personally I would use a more average sized country like Joya or Bosco but using Illia seems like a fine low end (though I don't know anything about FT outside the first few arcs). We should lowball as much as reasonable. Lowballing is better than the opposite. I also agree with Raven. Logic>Lowball. So can any of DodoNova2's results be used, or is a new calculation blog required that uses another method and Ilia's size? I additionally agree with Raven's idea of going with the end that makes the most sense in comparison to the context. I also agree with Raven calc. What calc puts Fiore at 4000km again? @Kepek - This does. The distance from magnolia to hargeon is 370 kilometers, so scaling that to Fiore makes it >4000km. How exactly did you get 20 Teratons for Ilia btw? I'm not sure I understood that equation. @Dodo - well, you scaled Midi from north to south where the diameter is at its utmost. That would be more than enough to engulf the country inside of it twice-over with almost nothing outside of it. I got incredibly defensive when I saw you do the same for Minus since that would result in High 6-A for a country that's baseline 6-A (to be fair, i'm kinda downplaying Minus). It's probably best to go with the low end when dealing with Statement only calculations, especially when it's as vague as this. "When we evaluate calculations we do not necessary are required to always go with the absolute low end. Instead the goal is to go with the most logical result after having evaluated not only that one specific feat but also have taken the surroundings in the verse into consideration." I don't mind going with the logical result but when the logical result is anyone's guess then it's better to lowball than it is to make an inaccurate upgrade. After reading TataHakai's reply, if this is supposed to be a vague statement, then I agree with using the lowball to be a bit safe. Yeah, they always mentioned that "Etherion has the ability to completely destroy a country". Well idk anything about the calc, but it looks like multi-mountain / 6-C realm from the scans I saw. Idk how people are determining a size. @Unite - The calc i did in my blog was an explosion caused by Etherion that would be Low 6-B+, which was the end i was arguing for, but there's many statement stating it could destroy an entire country, so we are scaling based off the size of the smallest country in the verse. Low 6-B+ if i recall correctly is also the end that was accepted in the OBD if i recall correctly, whichever end uses the smallest country there is the one i'm fine with. @Tata - Well, the feat i calc'd was with Etherion blasting a part of Seven, but Raven pointed out that the area might not be Seven, so the feat is questionable. So we might as well be scaling to Ilia, the smallest country, which would give 6-B. I also agree with Tata. Using the largest country is obviously wrong, but using the smallest is wrong as well. Both are distinct from what an average country would constitute as. In the real world, Russia is significantly larger than what I'd consider an average country, while Uruguay is significantly smaller. Russia is continent sized while Uruguay is on the high end of Large Island going by our standards, so, if we had to choose between the two for a country busting calc, Uruguay would indeed be the best approximation. Doesn't matter what rank it is in size. It's more than 2.5x the size of the smallest country. Oh, and that it's not the smallest country. Widespread destruction for that size of a country would still be 6-B. And that was not a time where they said the entire country would be destroyed. They were worried about people's lives and property damage. From my understanding due to Etherion never have on Panel actually destroyed a country, the possible destructive capability is yet unproven and unconfirmed - since not even inverse no one has ever witnessed it life to such an extent. On the other hand the on-panel flashbacks of its first usage show the opposite side, which is an incomplete, still expanding blast of fire. So going with the small countries such as Ilia or Minia should be fine. You could technically even make a case for Fiore, seeing it IS still a small country in comparison to the big players out there and only around 2.X times bigger than Minia for example. Im fine with both ways, since they do not dramatically change tiers. Everything stays in the 6B tier. And we are kind of generous towards other verses in general regarding these things. I agree with Cin on using the small countries. There's no reason to use the Large Country size, that would just be inflating the results. People are talking about mid ends, but normally isn't it that when we're not sure of result, we do the low end to be safe? I agree with Raven and Dodo tbh. To be frank, I think the people above haven't put up good logic other then I agree with Cin. And just based on the work from a monkey who barely does/doesn't do calcs? Looks like Dodo did more for the verse. I agree with RavenSupreme and DodoNova2. We don't just lowball anything just to be "safe". Forgive my intrusion, but why can't we use Caelum as the basis for Etherion Calc? Etherion was shown on screen targeted that country after all. I'm having a bit of a hard time deciding, but I'm switching back to basing calculations off of context/logic (What RavenSupreme said). Otherwise, I generally don't care what end gets chosen. I am leaning toward agreeing with Matthew of using Fiore, so we keep a low estimation, but not the lowest possible, but I am not a calc group member. Anyway, perhaps you should also decide which method that should preferably be used for such a calculation? Near total fatalities formula or something else? Since this matter is not yet settled and right now the discussion is what country to use for a low end, i decided to give a perhaps better approach which satisfies everyone. It includes the lowest possible countries as well as regular small countries such as Fiore and Ka-Elum, to find an average size, without inflating it with the big countries. That might be a good solution, yes. ((4261/0.28)^3)/1000 = 3.52 Petatons of TNT. Halving it Gives us 1.76 Petatons Which is still Continent Level. Hmm. That does seem exaggerated. Country level stems from our real world take on countries. In this fictional setting the countries are simply a lot bigger, comparable to continents from our real world. Out of curiousity, Tata, can you quickly put the numbers in for just Ilia? I thought you were supposed to put radius--not the diameter in for that equation (forgive me if i'm wrong). Result after dividing by 2 should be 440 Teratons, which is Large Country level, but I see not why we would use the countries that are 2.5~4x bigger than Ilia. The only statement made on Caelum regarded "damaging lives and properties", not that it would obliterate that specific country let alone kill everyone there--therefore I am against using Caelum or Fiore to begin with. So 138.2 Teratons final result. Use the radius for the near total fatalities formula. My bad, we really should put these kind of things into the explosions page by the way, saves the confusion. Ilia is 34 Teratons as Cin said. I believe a compromise is the best way to solve this, if we're not going with the low end as always. "At least Country level, likely Large Country level"
Thanks. So after having evaluated all these different approaches I have come to a - at least for me - final verdict, which I hope some of you may agree with. 1. We do not use the result from Etherion potentially simply destroying a country partially (the small chunk of land of the country seven) since this would be the using the lowest of the low ends by a mere blast radius perspective, which gets contradicted by all the canon information we know about Etherion. The Large Island level calc is therefore something I would not use. 2. 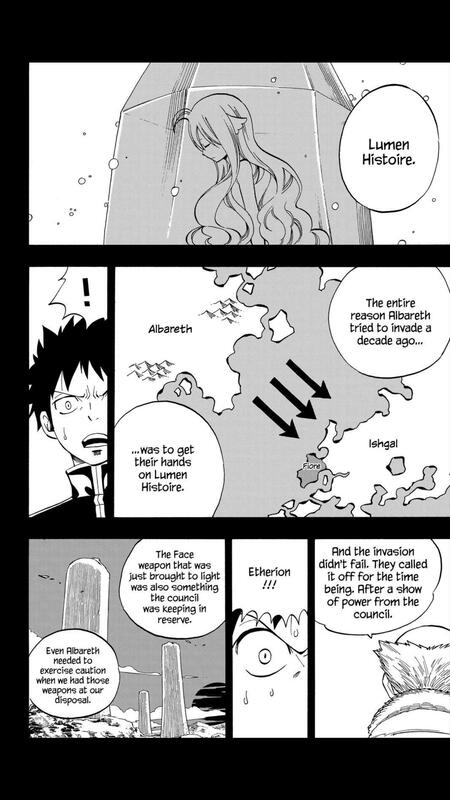 We do not use a middle end from accumulating the countries, finding one average diameter for the blast radius and Etherion to cover, as it would result in outlierish and exagerated results not being in line with the remaining showings of the series (We have Final Attacks from Main Spriggan villains at EOS barely managing to destroy a boat for example). The Continent level calcs are therefore also something I would not use. 3. Instead we use the potential destruction of the small country of Ilia. While it may be the smallest country, the result of the calculation is not the lowest possible (which would be the calc from Seven) and ends in a result in line with the portrayal and is understandable to communicate in the verses overal power ruling. The (Large) Country level calc is therefore the one I would use and support. It combines the low end country wise with a solid result, without purposedly lowballing air blast radius to the lowest possible implication while at the same time not being affected by bigger countries diameter, inflating the result. I'm fine with using a variable tier such as that, as long as we specifically label them as their energy requirement. "At least Country level, likely Large Country level (The Etherion has the capacity to destroy a country within Ishgard. The smallest requiring this amount of energy to destroy, while average sized countries such as Fiore require this much)"
Or we could make a blog with both ends and put the link there. I can make a blog with both ends and just leave it at that after i have it evaluated here. Here is the blog post with both values. I am personally fine with Raven's suggestion, but it is not up to me to decide. @Ant - the suggestion to use the average of the 4 countries (even though one of them is using the wrong diameter) is very close to using Fiore itself, so it might as well be a negligible difference. I'm happy with using both the Ilia and Fiore ends as a compromise. Raven discarded the notion of using an average in his latest post, if I understood him correctly. I suggested we compromise with "At least Country level, likely Large Countrylevel"
Is a new calculation blog required to justify that compromise solution? Yes, I noticed. I think that CinCameron20 can start a Fairy Tail revision thread to decide which characters that need to be rescaled then. Or we could just handle it here if the process is rather straightforward. I think there is a disagreement on certain characters such as Natsu scaling to Etherion, but i'll let people who are more knowledgeable about the verse argue over that. I'm clueless as to the context in that regard. Basically, all High 6-B or "At least High 6-B" characters need to be changed to "At least 6-B, likely High 6-B". That's about it. Okay. That seems fine. Are you willing to link to your calculation in the Etherion page, investigate which Fairy Tail character pages that need to be modified, and handle the changes yourself? It would be more efficient to do so than arguing for a few hundred posts again. All of those pages are currently locked. I applied the edit to Etherion. I will unlock Acnologia, Natsu Dragneel, and Zeref Dragneel for you. Tell me here when you are done. Edits have been applied. Profiles can be locked and this thread is concluded. Okay. Thanks to everybody for the help.